Memphis rock outfit The Switchblade Kid is band building a reputation for modern monuments to punk, garage rock, and nostalgia bombs. Much like their music, the band’s aesthetic is full of grain and fuzz in the warmest of ways. Last year they let loose their self-titled debut via Miss Molly Music. The album was not only notable for its sound, but its accompanying videos, which also carried a very familiar and warm aesthetic. In addition to gearing up to release a new album, the band is coming out with a DVD containing all the music videos to last year’s full-length. We were able to secure the premiere of “Veronica Sawyer” before it is released on the DVD later this month. For All the Sad Bastards is a quick follow-up to the self-titled album and a collection of solo tracks band leader Harry Koniditsiotis recorded from 2002-2012. 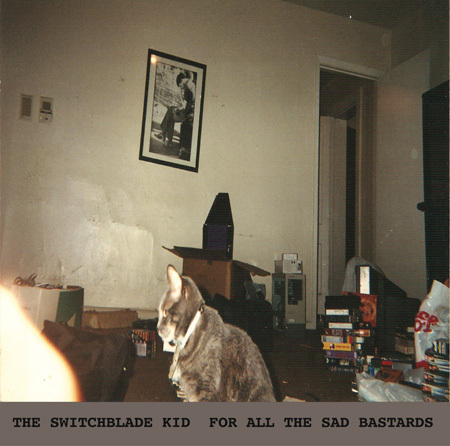 The album expands on the Switchblade Kid’s throwback sound, including slowed-down psuedo-country crooners and indie rock tracks with feelsy ’90s vibes. Any fan of guitar music from the era will find at least one thing to fall in love with. This new batch of tunes carries the theme of warm throwback rock laced with nostalgia and memorable melodies. The album will be available to purchase on October 19 via Miss Molly Music and available on 12″ vinyl. So how can you get your hands on such an awesome record? It’s simple! In the comments below, tell us your favorite YouTube music channel. Since I’m a sucker for obscure electronica, I’m going to have to go with fellow Memphis act Cvlt45‘s. One winner with a North American mailing address will be chosen on Wednesday, October 23. You can see the DVD of music videos as well as the band perform new tunes from For All the Sad Bastards when it premieres at the Black Lodge Halloween Party on October 19. Entry is free, and costumes are welcomed.